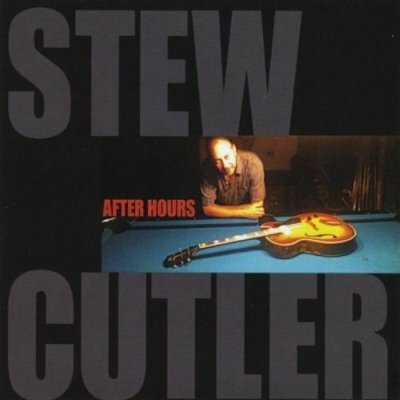 The centerpiece of New York City based Jazz and Blues guitarist and songwriter Stew Cutler’s new album After Hours is his instrumental interpretation of The Temptations’ classic song “Just My Imagination.” In addition to Stew Cutler’s beautifully played guitar, the cast of musicians on this recording are better than good, with organist Chip Crawford shining on this tune, drummer Skoota Warner masterfully and elegantly keeping the beat and acoustic bassist Booker King laying down a strong, but subtle foundation. This song is so beautifully performed and so expertly mixed that one forgets that normally you hear a singer too. The album After Hours, has a “live” feel to the music and much of that credit can go to the fact that most of the music was recorded with minimal takes on one day, yet the production quality is excellent. Lots of percussion is featured on Stew Cutler’s original song “Bambou,” and Book King makes his bass speak. Saxophonists will tell you that instrument is the closest to sounding like a human voice, but then they are biased anyway (smile) however, in this instance it is the bass that we find conversing with us. On Charlie Parker’s “Au Privae,” a bebop tune, Skoota Warner uses his cymbals to keep the time and the song once again showcases Stew Cutler’s magic and mastery over his instrument. Cutler adapted the melody ever so slightly to infuse the song with a little funk. Stew Cutler’s unique style of playing with his pick gives his playing a little more organic and acoustic feel, even though he is playing an electric guitar. “Recluse,” introduces a trio of Stew Cutler original songs that follow one another on the album, the others being, “Lukewarm,” and “C.C.” “Recluse,” features Stew Cutler’s son David Cutler on electric bass guitar are reminiscent of George Benson, only backed by Chip Crawford’s funky Hammond B3. The nimble fingers on the fretboard keep the song moving spritely and the more ethereal guitar is juxtaposed to the deeper, soulful organ grooves. When one listens to songs like “C.C.,” which is sure to stir the juices of any diehard fan of Jazz, Funk and Blues, one is intrigued by both the beauty of the music and the creativity of Stew Cutler’s compositions. The listener is party to an intimate conversation between bass, the electric guitar and the organ, before the mood turns funky and more up-tempo. After Hours, closes with another gem of a tune, “Them That Got,” a Bluesy song featuring the fabulous vocals of Paul Saxx. The singer is down to his last pair of his shoes and rent is hard to pay and the message is “Them that got, is them that gets.” The question is posed, “if you have to have somethin’, before you can get somethin’….” The message is delivered not in a bitter way or as a song of protest, but in a subtle, tasteful manner that is more like a man standing on a street corner watching the more economically elite go by and wondering aloud. The only accompaniment is the guitar and the melody is pretty and simple. The organ trio featured on this album was the realization of a long held desire by Stew Cutler to do a recording of this type and it is not a working band, but we can wish and dream that we soon see these musicians playing together live.